Range: 0 - 5 (Iron); 0 - 3 (Copper). 25 tests per factor per vial. Range: 4 - 10 (pH); 0 - 50 (TCl). 25 / 50 tsets per factor per vial. Suitable for drinking, pool and food and beverage use. 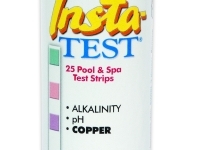 Range: 0 - 3 (Copper); 6.8 - 8.4 9 (pH); 0 - 180 (Alk). 25 tests per factor per vial.